The financial marketplace headquartered in Dhaka, Bangladesh. 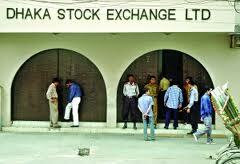 The Dhaka Stock Exchange was incorporated in 1954, and formal trading began in 1956. Originally, the exchange was called the East Pakistan Stock Exchange Association Ltd, and in 1962 the name was revised to East Pakistan Stock Exchange Ltd.
Secondary data: the study also used secondary data. For this purpose we collect information from various sources such as various publications of DSE. – Listing of Companies. (As per Listing Regulations). – Providing the screen based automated trading of listed Securities. – Market Administration & Control. – Publication of Monthly Review. – Monitoring the activities of listed companies. (As per Listing Regulations). – Investors grievance Cell (Disposal of complaint bye laws 1997). – Announcement of Price sensitive or other information about listed companies through online. Memorandum of Association, Articles of Association of the company. Letter regarding permission for on-line trading. Deed of Declaration as per clause 5 (b) of General Rules and regulations of DSE. Two copies stamp size recent photograph. In case of disclosure of news in any scrip, the circuit breaker percentage will be changed to a Market Operations specified value and will persist at this value for a specified number of days. For new scrip, for specified number of days after the first trading day, the percentage is a Market Operations specified value. Till the first trading day for that scrip, there will be no circuit breaker percentage. In case of book closure, the Exchange will provide an absolute value of circuit breaker, which will be used for a Market Operation specified number of days, following which it will revert back to the old value of the circuit breaker. 1.Checking whether the brokers are maintaining rules and regulations under SEC, company act, and income tax law. 2.Making physical visit to the broker houses as per the command of SEC or Surveillance department of DSE. § RDBMS (Relation Data Base Management System): Sybase. Research is a foremost necessity for any stock exchange. In order to fulfill the need DSE has established a Research Center and are keeping close contacts with the UN bodies, international research organization, etc. This department has been publishing a monthly bulletin “PORTFOLIO” It was earlier published in the name of “market update” This monthly magazine is being distributed to the concerned persons and agencies including Bangladesh Missions abroad, Foreign Missions in Bangladesh, Stock Exchange-World wide etc. in addition to the transaction data analysis, Portfolio carries in depth analysis, interpretative write-ups on the share markets, investments, capital flow and formation and the state of the economy in general. DSE also envisages publishing fact book, booklets on trading rules, clearing & settlement rules etc. Trading system of Dhaka stock exchange and its aspects. Internet Trading System (ITS) is DSE venture on behalf of the brokers. This site has been provided by the Dhaka stock exchange so as to give customers the convenience to trade or put orders on DSE from any where in the world irrespective of the trading hours of the stock exchange. The trading is done by registering on the site under some existing broker of the stock exchange. Usually stockbrokers make their own website interactive for their clientele. Here DSE it self is offering the service on behalf of the stockbrokers. Choose your broker we provide. We treat all members equally. If you ask which broker to open an account with? Our answer is it is your choice. When you open an account, your broker will prepare your electronic file. Your life will be accessible to you only. You will be given a password. When you will be able to fill in the account opening for electronically, you yourself will set the password. But it your product a hard copy to your broker who will key-in your data for you, the password will be set by the brokerage house staff. ÆAuction session can be of two types viz. Close out rate = (Weighted Average of Auction Trade price X Close out%) 100. 4 Spot Orders can be modified or removed before they are traded. On modification, the spot order looses its time priority. 3 * Bulk orders will not be considered for BBO formation and closing price calculation. The new automated Screen-based trading system in Dhaka stock exchange is replaced by saying good-by to the traditional cry-out system. Unlike other automation project, this is not just computerization of the trading floor with the typical data itself. Leading Stock Exchange who had already automated the transaction operation of their trading floor are gradually moving towards this relatively new technology of screen based trading. Dhaka stock exchange has accomplished this trading system from their own resources. By introducing automated trading system, transparency has been ensured. At present, every thing is going on manually. No manipulation is possible by this system. This system ensures easy and quick communications between traders and the investors. In the traditional Cry-out system, scripts were traded one at a time. Although, trading lasted for a few hours, practically one scrip gets only a few minutes to be dealt in. The main facilities offered by automation, are placing of orders both on-line and off-line. Brokers workstation-located in their office premises-allow investors to trade each and every scrip through out the business hour. The wide area network of Dhaka stock exchange that virtually links the entire Bangladesh through the normal phone system, also promise a wide participation of the investing public. Not only that, with an efficient network, the oversees investors can now access the market which is very important for the Bangladesh market as the huge number of the citizens are living abroad and willing to invest in this country. Proper monitoring is possible under the automatic trading system; proper monitoring is possible through surveillance software module. At Dhaka stock exchange, surveillance department monitors the overall trade situation by using this computer system. Also, it had a terminal installed at Securities and Exchange Commissions (SEC) for the inspectors to keep the vigil. When deals are executed through super fast machines, it is bit difficult for human being to do the monitoring at the similar pace. * If any instrument declared as Compulsory Spot then Trades of Block and Odd-lot market of that Instrument will be settled like Spot Market. * Howla Charge, Laga Charge & Tax are always payable to DSE at Pay-In date for both Buyer and Seller traded in Public, Block & Odd-lot Market. * Howla Charge, Laga Charge & Tax are always payable to DSE at T+1 day for both Buyer and Seller traded in Spot Market. * Outside-Of-Netted settlement for “A” Group instrument has been withdrawn from 10th Dec 2006. * DVP Trades are Off-Market Settlement (Broker to Broker). * As netting system for shares has withdrawn, for A, B, G & N group instrument, member will have to deposit the full shares at the DSE on T+1 after selling the shares, In case of purchasing such shares, the buyer will have to deposit the Balanced (Netted) money traded in Public, Block & Odd-lot market at the DSE on T+1. ** Under the Trade for trade settlement system, member will have to deposit the full money at the DSE on T+3 after purchasing the shares, In case of selling such shares, the seller will have to deposit the full shares at the DSE on T+3. Investors are allowed to quote their expected price I the there Buy/Sell order. The-trading system of the Exchange automatically matches the best prices. Before execution of an order, the investors through their brokers may revise the price. Therefore in broad sense, the market forces of demand and supply fix prices. Some stock exchange members also serve as director of listed companies. This can lead to the chance of insider trading especially in such a poorly regulated market. Certifiers of financial statements and Property value’s of the company are the identical. Corporate governance – sponsor-owners are managing the firm. All most all cases, no professional management are hired to run the affairs of the listed company. There has been general allegation by the investors that there has been some fraudulent acts insider trading which may have contributed to the abnormal fluctuation the pries of transparency, systematic deficiency and management inadequacies in the conduct of the trade by the stock exchange. Bangladesh Capital Market, Published by Dhaka Stock Exchange Ltd.
Money and Capital markets, Peter S. Rose. Hossen, Anwar, “Management of Dhaka Stock Exchange.”2008. CDBL Byelaws, Published by Central Depository Bangladesh Ltd.2000. “Share Bazar” –Monthly magazine on Share Market, Published on February-2009.